Giving Gratefully | A blog about child sponsorship and helping "the least of these"
The first annual Walk with Compassion in Tucson was held last Saturday at Brandi Fenton Park, and photographer Jodi McGinn created this slideshow to showcase the event. There were 85 participants, and seven children were sponsored. As we settled into our seats in a theater in El Salvador, we had no idea of the awesome event we were about to enjoy. This large group of sponsors filling the theater had spent that morning visiting Compassion projects in one of the most violent countries in Central America. It is a country ruled by gangs, and we learned of some of the challenges these children face. We heard their stories throughout the day, sometimes from the children themselves, and sometimes from their tireless teachers and pastors at the projects. We worshipped and prayed with them, played games, danced to silly children’s songs and shared a meal. We laughed with them, and just as easily cried with them, as they made their realities known to us. It was a day that left us with our hearts filled, and I could not imagine my heart could become even more full. But once the music in that theater began, it was clear that a heart filled by God knows no limits. This was no ordinary show. It was an extraordinary musical experience, put together and performed by more than 100 Compassion children for a theater full of sponsors. Before my eyes was an entire symphony orchestra and choir made up of Compassion children, using their God-given talents, and playing at a level made even more impressive when I later learned how infrequently these children played together. They could not take their instruments home, but had to leave them locked up, only to be brought out once each week when they gathered to practice. Listening to these children perform, sharing their musical gifts with us, and feeling the music wash over me, I thought this must be very close to the soundtrack of heaven. Please enjoy the following videos, and if you feel moved to do so, you can donate to this talented group by clicking here. Pastor Raul and Israel share their inspiring story to a group of Compassion sponsors. These are the words Raul, a Compassion pastor in El Salvador, spoke to a local gang to reclaim his student, Israel. Israel was only 7 years old when an accident with a kite and electrical wires severely injured his arm. After the incident, Israel spent two years in the hospital recovering. When he finally left the hospital, young Israel returned to school, where he was bullied due to the visible disfigurement of his arm. His peers told him he would never hold a job or be able to support a family. Desperate for acceptance, Israel later joined a gang, where he gained a sense of belonging. He stopped attending the local Compassion project where he was registered, and Raul noticed his absence and began to search for him around the community. “Whenever he would see me, he would run away,” Raul said of Israel. But Raul did not give up. Eventually, Raul spoke with Israel and asked him what the gang was giving to him. Israel self-consciously rubbed his injured arm as he told his story to a large group of Compassion sponsors, who later lined up to hug this inspiring young man. Israel and his megawatt smile! He explained how Raul convinced him to leave the gang and return to his Compassion project, where he did, indeed, receive a family. And now, this young man radiates warmth and a humble spirit. With the love of his Compassion family and by the grace of God, Israel has even overcome his greatest fear: electricity. Israel is earning a certificate in electrical engineering. Which child will you claim as yours? 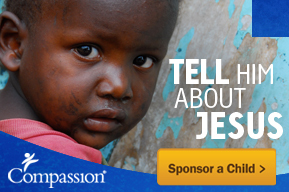 When will you partner with Compassion to keep a child off the streets of El Salvador? Click here to see who is waiting for you. Sunsets are beautiful, but I find their beauty greatly increased when I take the time to appreciate their details. The many shades of yellow, orange and red, slowly cooling to shades of pink and purple are details that can be overlooked with just one glance. The sun’s warmth heating your face, then fading, cooling over time, requires a few minutes to enjoy. Sunsets are beautiful, but these details greatly enhance them. It’s when I take a moment to notice the details that I find myself truly appreciating an experience, and it’s in that time that I often reflect on how God is in each of those details. Sometimes God’s presence in the details is subtle, and I have to slow down to see it, but one afternoon in Nicaragua last summer, His presence was as undeniable as crashing into a wall. My two sons and I were visiting my sponsor son Jose’s Compassion project that day. It was our second time meeting Jose, and we had already spent a couple of hours with him at lunch. I’ve found my meetings with my sponsor children to be intense bits of time, full of emotion, and always finished too quickly. They’re the kinds of experiences where the clock seems to speed up, and the desperate attempt to enjoy every precious moment to the fullest somehow makes those moments a blur. This day seemed to be heading in that direction. It was slipping past too quickly, and I was already dreading its end. Jose showed us around his project, stopping at the kitchen, the chapel and the main office, where we were able to look though his records. Next he took us to his classroom, where his classmates were seated in desks, listening to a teacher. Their usual teacher had been spending the day with us, so today they were being taught by a young man. He looked up as we all walked in, and our translator introduced us to him and the children. Then a look of recognition appeared on his face. He excitedly told our translator something in Spanish. “I remember her,” she translated, as the young man named Kevin gestured towards me. He continued explaining to her, and we found out that he did, in fact, remember me. When I first visited Nicaragua in 2014, two years earlier, Kevin’s sponsor was on that same group tour. On the last day of the tour, all of the sponsors were able to meet their children at a local amusement park and spend the day with them. Kevin remembered seeing me on that day, when I first met Jose. What were the chances that we would ever see each other again? Well, it was clear this encounter did not happen by chance. God was in these details. There are 177 Compassion projects in Nicaragua, and on that day, we walked into the one project where Kevin was working. There are 46,514 sponsored children in Nicaragua, and two years earlier, Kevin was one of about 25 Compassion children at the amusement park on visit day. I stood there amazed realizing God’s hand in this meeting. We took photos together, and Kevin told me his sponsor’s name. I assured him I would contact his sponsor and share his message and photos with him. I was so excited to let Kevin’s sponsor know that after he graduated the Compassion program, he had gone on to become at teacher with Compassion, helping young children like he had been. We both were a bit emotional by the end of our quick meeting. I was honored to stand in for Kevin’s sponsor, and to hug him and encourage him. And as we walked away, exclaiming over how incredible that meeting had been, I knew God was at work, slowing me down, reminding me to appreciate the smallest details throughout the day. We went to Jose’s house next, and it was raining, so we crowded into his home, which was small, but dry, and we sat together. Jose scrambled to find chairs for us, carefully wiping mine down with a rag before letting me sit. We were quite a group, including Jose, my two sons, me, our translator, Jose’s mother, two younger brothers and his teacher. We talked, laughed, and even sang a little, enjoying a rainy afternoon together inside. And when the day ended, it still was difficult to say goodbye. But God had slowed us all down that afternoon, and He had certainly been in all the details.